(Nanowerk News) Scientists in Washington, DC, are reporting development and successful tests of a new way for exploring the insides of living cells, the microscopic building blocks of all known plants and animals. They explode the cell while it is still living inside a plant or animal, vaporize its contents, and sniff. The study appears in online in ACS' journal Analytical Chemistry ("In Situ Metabolic Profiling of Single Cells by Laser Ablation Electrospray Ionization Mass Spectrometry"). 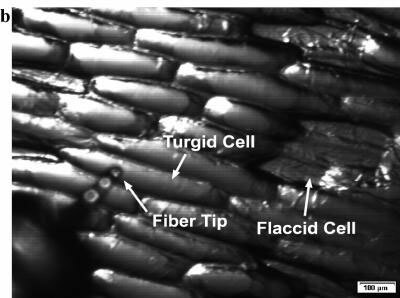 A tiny glass fiber is used to vaporize contents of cells to study the cell contents. Akos Vertes and Bindesh Shrestha note that knowing the contents of cells is the key to understanding how healthy cells differ from those in disease. Until now, however, the only way to "look" inside an individual cell was to remove it from its natural environment in an animal or plant, or change its environment. But doing so changed the cell. Scientists never knew whether one cell differed from another because of the disease, or because they had removed it to a new environment. The new report describes development of a new technique that uses laser pulses focused through a tiny glass fiber to explode a cell and turn its contents into vapor. Scientists then use a laboratory instrument to analyze the vapor and get a profile of the chemicals inside. It can reveal differences between diseased and healthy cells, even between adjacent cells in the same tissue. The scientists used this new technique to analyze the contents of living plant and animal cells and show that it quickly and accurately identified important chemical details that would have been overlooked using conventional techniques.